This artist's illustration shows a giant cloud of hydrogen streaming off the warm, Neptune-size planet GJ 3470b. Intense radiation from the planet's host star is heating the hydrogen in GJ 3470b's upper atmosphere to a point where it escapes into space. A gaseous alien world is evaporating at a record rate, shedding considerable light on an exoplanet mystery, a new study reports. The Neptune-size planet, known as GJ 3470b, orbits close to a young, active red dwarf star that lies 97 light-years from Earth. 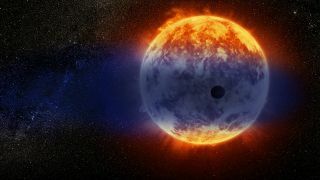 The radiation streaming from this star is stripping away GJ 3470b's upper atmosphere so dramatically that the planet likely won't remain a Neptune-size body for much longer, study team members said. "GJ 3470b is losing more of its mass than any other planet we've seen so far; in only a few billion years from now, half of the planet may be gone," Sing added. The researchers, led by Vincent Bourrier of the University of Geneva in Switzerland, used NASA's Hubble Space Telescope to study GJ 3470b, which lies 3.7 million miles (6 million kilometers) from its parent star. That's just one-tenth the average distance between Mercury — our solar system's innermost planet — and the sun. This graphic plots exoplanets based on their size and distance from their star. Planets about the size of Jupiter, planets roughly the size of Earth and so-called super-Earths are found both close to and far from their stars. But planets the size of Neptune (in the middle of the plot) that are close to their star are scarce. This so-called desert of hot Neptunes shows that such alien worlds are rare, or, they were plentiful at one time but have since disappeared. The Hubble data show that the red dwarf's proximity and activity are taking a serious toll on GJ 3470b. The telescope's Imaging Spectrograph instrument detected a vast cloud of hydrogen gas surrounding the planet — hydrogen that was once part of GJ 3470b's atmosphere. Indeed, the planet, which is just 2 billion years old, may already have lost about 35 percent of its mass in this way, the researchers said. Which brings us to the exoplanet mystery. Over the past decade or so, astronomers have found lots of "hot Jupiters," "hot Earths" and "hot super-Earths" in extrasolar systems — tightly orbiting gas giants, Earth-size worlds and planets just a big bigger than our own, respectively. But there's a surprising dearth of "hot Neptunes." "The question has been, where have the hot Neptunes gone?" Bourrier said in a different statement. The new study was published Thursday (Dec. 13) in the journal Astronomy & Astrophysics.